Gil De Ferran's formula 1 career never really got off the ground - probably because of a bang on the head. Back in 1992 de Ferran was the British Formula 3 Champion when he did his first F1 tests with Williams. That was really only a prize drive organised by the Formula 3 Association and it was not until the following year that de Ferran got a proper F1 chance with Arrows in a test alongside Jos Verstappen at Estoril. The Dutchman got in the car and matched regular driver Christian Fittipaldi within a few laps. Later he went off and destroyed the car but that did not matter. He had made his reputation. De Ferran, on the other hand, hit his head inside the team transporter and needed stitches. He did drive by his lap times were not good because of the accident. After that it all went quiet for the Brazilian and at the end of 1994 he went to the United States to begin a new career with Jim Hall's CART team. He was CART rookie of the year in 1995 and scored his first win that year at Laguna Seca. There was talk of a Ligier F1 deal at the time (with Tom Walkinshaw) but Gil had a contract and stayed in America in 1996 and was signed to drive for Walker Racing in 1997, despite rumours of talks with the new Stewart Grand Prix team. The timing was just not right and then in 1999 the offer came to drive for Roger Penske in 2000. It was too good to miss and led to two CART titles in 2000 and 2001 and finally to victory in the Indianapolis 500 in 2003, despite the fact that he was fighting back from a serious injury after an accident in Phoenix which left him with fractures in the neck and lower back. At the end of the year there were a few rumours suggesting that a Brazilian sponsor might help him get a drive at Jordan but it seems now that this was more to do with the team trying to get Brazilian money. Gil retired at the end of that season and began a career as a commentator. He now admits that this was not easy. "I am a racer at heart ," he says, "and I missed the competition side. I did not want to leave the sport completely and over the last year the competitive juices were still flowing." Thus when BAR started talking about a job running the team racing side of the team, de Ferran was interested and excited. "This job answers my emotional and intellectual needs," he explains. "It is an amazing opportunity for me. This type of role is definitely something I had in mind when I retired from driving and it is coming at the right time. It is going to as huge challenge for me." The obvious question is whether or not Gil sees F1 as unfinished business. "I don't think so," Gil says, thoughtfully. "I has a lot of fulfilment in my driving career, especially in my last stint with Team Penske, when I was able to win races and championships and the Indy 500. I finished my career very satisfied and happy with what had happened. I am not really bitter about anything. I have always had a fascination with F1, ever since I was a kid and watched Emerson Fittipaldi battling Jackie Stewart. When I went to Europe I wanted to be an F1 driver but my road took me in a different way but it was just as fulfilling. Doing what I am doing now has not much to do with any unfinished past. It is a new avenue and a great opportunity to grow. I lived in the UK before for seven years of my life and I am looking forward to that in a way. But in a way I will miss the USA as well." Mention of Jackie Stewart begs the question whether the Scot was involved in the discussions between de Ferran and BAR. Nick Fry, after all, was a close collaborator with Stewart at Ford for many years. 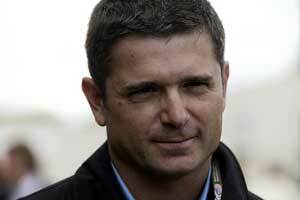 "Jackie has been someone I turn to whenever I have big decision to make," says de Ferran. "It has been like that since the early 1990s. The Stewart family have been my friends since I drove for them. I met Nick through Jackie and when this came up I sought Jackie's advice." "It was the same on our side," he says. "I have known Jackie pretty well for a number of years and there were a number of discussions about Gil's personality and Jackie can take credit or otherwise for this arrangement and has been very supportive on both sides." De Ferran knows that Formula 1 is a piranha pool but says that his role is not the same as the one that Bobby Rahal had at Jaguar Racing. "I did not talk to Bobby since this came about," he says, "but it is different people and different companies. I am a different person to Bobby. This will be an enormous challenge but I am ready for it. It is something that I want to do and I am looking forward to that challenge. All I can tell you is the people I have dealt with so far - mostly Nick and BAR technical director Geoff Willis - and it has been a wonderfuil courting period. I feel very comfortable and I clearly understand what I have to do. The role is different to what Bobby was trying to do at Jaguar. I will do the job and hopefully deliver the right results. "My first task is to do a lot of watching and listening. Get to know Jenson Button and Takuma Sato better. I have to see the lay of the land. It is going to be a very accelerated process and I am not going to disrupt the workings of what I believe is essentially a very competitve operation. I think that in the past I have done a good job being able to focus on the job in hand and not get too distracted by other things that are not essential to the results in competition and I hope I will be able to do the same. My role is clear: it is to try to win in competition and find the best way to gain an advatange and have an edge. I did that as a driver and I will continue to try to do that. "Jenson is one of the best drivers in the world today and someone who has the potential to not only win races but also the World Championship and I am very much looking forward to working with him. I don't think he needs to do much to become a winner. His performance has been incredible. To win races a lot of things have to come right at the same time. It is a the job of the whole team to make that happen."